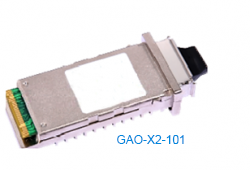 GAOTek presents an eclectic range of X2 transceivers. We offer BiDi (Bidirectional), CWDM (Coarse Division Multiplexing) and DWDM (Dense Division Multiplexing) transceivers in our collection for sale to the United States, Canada and Globally. 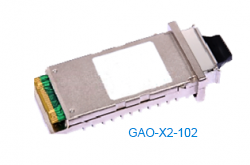 X2 transceivers are essentially enhanced XENPAK transceivers for 10 Gbps Ethernet fiber optics. They consume less power and have a smaller form factor as compared to XENPAK transceivers. They are hot pluggable devices for fiber connectivity in data communication applications. Our X2 transceivers are equipped with DFB or EML type transmitters and PIN type or APD type receivers. These fully integrated modules consist of Mux/Demux with clock and data recovery (CDR), and XAUI interface. They comply with 10GBASE-LR as per IEEE 802.3ae and X2 MSA standards. These modules are hot pluggable in the Z-direction and come with MDIO, DOM support. 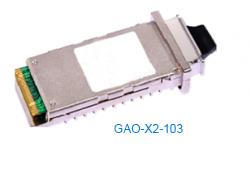 Our X2 transceivers are ideal for use in typical router line card applications, Storage, LAN and IP network. 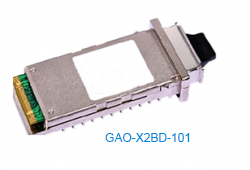 This 10 Gigabit 1270 and 1330nm Bidirectional X2 Transceiver is used with single-mode optical fiber to reach up to 6.21 miles (10km) transmission distance. 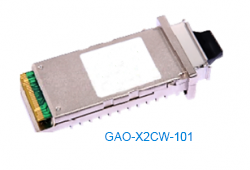 This 10 Gigabit 1270~1450nm CWDM X2 Transceiver is used with single-mode optical fiber to reach up to 6.21 miles (10km) transmission distance. 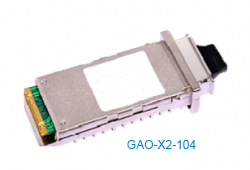 This 10 Gigabit 1470~1610nm CWDM X2 Transceiver is used with single-mode optical fiber to reach up to 24.85 miles (40km) transmission distance. 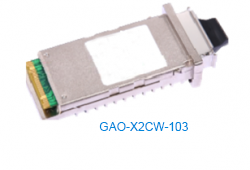 This 10 Gigabit 1470~1610nm CWDM X2 Transceiver is used with single-mode optical fiber to reach up to 49.72 miles (80km) transmission distance. This 10 Gigabit DWDM X2 Transceiver is used with single-mode optical fiber to reach up to 24.85 miles (40km) transmission distance. This 10 Gigabit DWDM X2 Transceiver is used with single-mode optical fiber to reach up to 49.72 miles (80km) transmission distance. This 10 Gigabit 1310nm X2 Transceiver is used with single-mode optical fiber to reach up to 6.21 miles (10km) transmission distance. This 10 Gigabit 1550nm X2 Transceiver is used with single-mode optical fiber to reach up to 24.85 miles (40km) transmission distance. This 10 Gigabit 1550nm X2 Transceiver is used with single-mode optical fiber to reach up to 49.72 miles (80km) transmission distance. This 10 Gigabit 850nm X2 Transceiver is used with multi-mode optical fiber to reach up to 984.25 ft. (300m) transmission distance.